A Hungarian camerawoman who made headlines in 2015 after being filmed kicking refugees, including children, has been found guilty of breaching public peace and sentenced to three years of probation. The actions of Petra Laszlo triggered “indignation and outrage,” Judge Illes Nanasi, in the city of Szeged, Hungary, said on Thursday, as cited by AFP and local media. The judge rejected the argument of Laszlo’s lawyer that she was trying to protect herself. Laszlo was sentenced to three years of probation, but her conviction may be dropped if she does not re-offend during that period, according to the judge’s statement. Laszlo was not present at the hearing because she had repeatedly received death threats, her attorney, Ferenc Sipos, told AP. “It is not a crime if somebody acts to defend herself… she was in danger, and she tried to avert this danger with her actions,” he said. Petra Laszlo was fired from her job at Hungarian TV station N1TV, after a video of her kicking and tripping refugees emerged and quickly went viral in September 2015. The footage shows Laszlo among a crowd of people running from the police at a refugee center near the village of Roszke on the Hungarian-Serbian border. 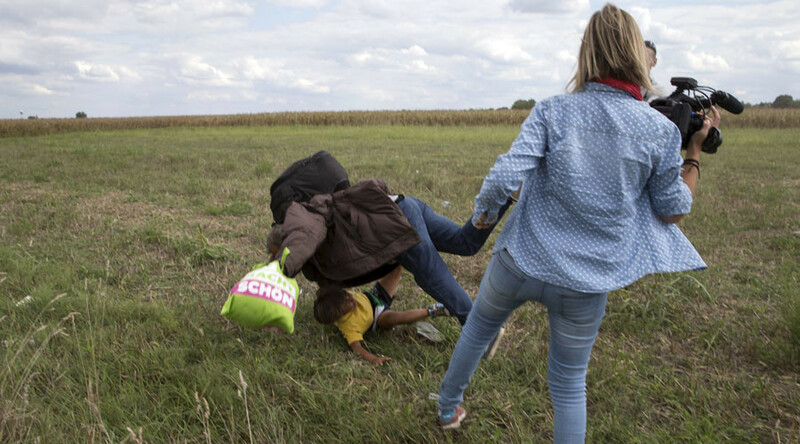 A couple of refugees bumped into the camerawoman, after which she kicked a young refugee girl. Then, filming a police officer attempting to arrest a man carrying a young boy, the journalist apparently stuck her leg out and tripped the man on purpose. He fell to the ground with the child. Laszlo, 40, apologized several days after the incident took place, saying it was a mistake. She explained in earlier statements that she had panicked and wanted to protect herself when hundreds of asylum seekers broke through a police cordon in a field and ran in her direction. “I’m just an unemployed mother of small children, who made a bad decision. I am truly sorry,” Laszlo wrote a letter to the local rightwing daily newspaper Magyar Nemzet. In an interview with Russia’s Izvestia newspaper back in October 2015, Laszlo said that she was only “trying to help police,” as the refugee had not obeyed orders. “I pushed him [the man with a child] only because I was afraid. I did not see that there was a child. I’m sorry that it turned out this way,” she told the paper. Also in 2015, information from the Syrian Kurdish Democratic Union Party (PYD) emerged that Osama Abdul Mohsen, the man tripped by Laszlo, was a member of the Al-Qaeda-linked Al-Nusra Front, and had committed crimes against civilians. The allegations did not, however, change public opinion of the former camerawoman.